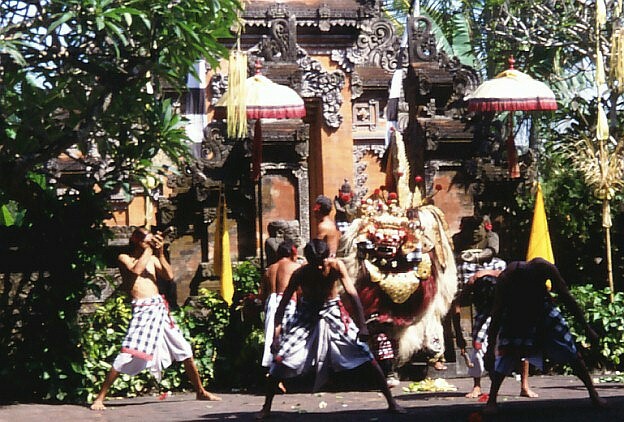 After an overture from the excellent and very polished gamelan orchestra, the performance begins with the entrance of the Barong. He struts around playfully, shaking his mane and tail. He wears a kind of saddle (although he is never ridden), and the saddle and tail are both covered in mirrors which scatter the light and deflect and confuse evil spirits. 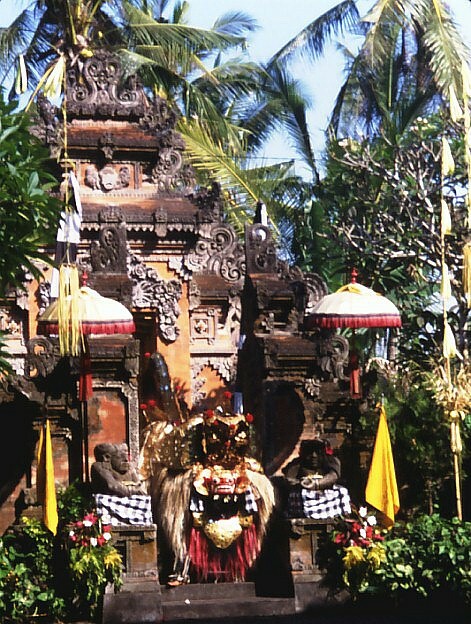 The Barong performs a comical dance, playing with his feet and tail, and clacking his jaw, and grooming himself like a real cat. 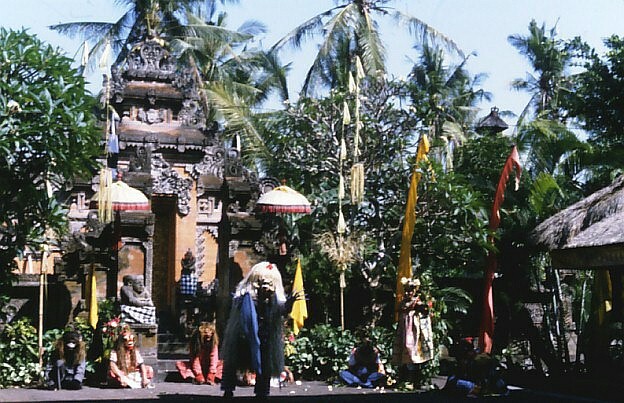 In this scene we are introduced to Sahadewa, the good and loyal son of Dewi Kunti. 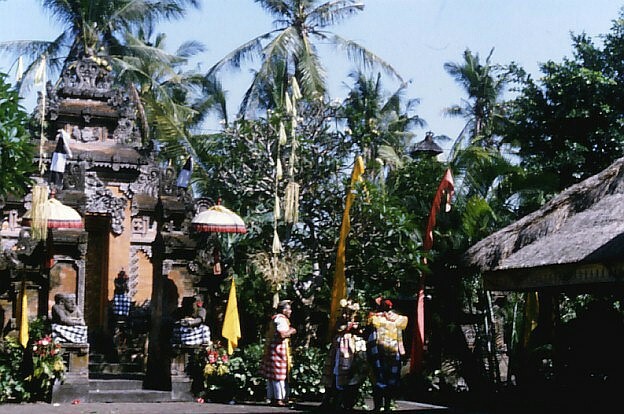 But a witch sent by Siwa has cast a spell upon Dewi Kunti. 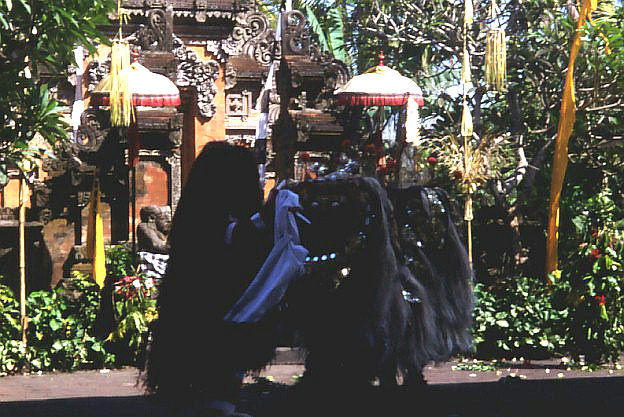 Under the spell, Dewi Kunti, acting irrationally, becomes angry with Sahadewa and she condemns him to death. The Prime Minister, also bewitched, orders Sahadewa to be tied to to tree in the cemetery to be devoured by Durga, Queen of Witches and Goddess of Death. 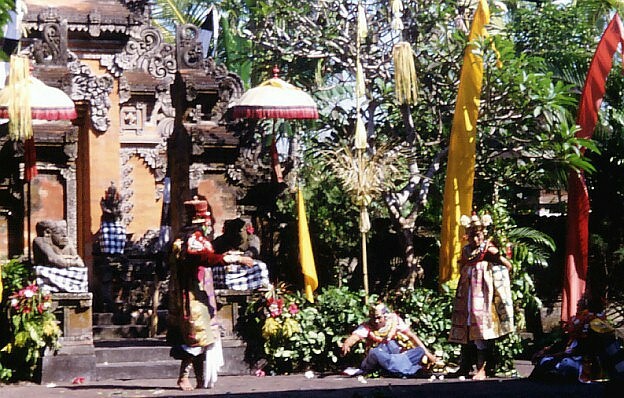 Sahadewa is tied to the tree, and left to Durga's devices. However, the god Siwa (the Indian Shiva) appears, and casts his own spell on Sahadewa giving him the gift of immortality. Durga, Goddess of Death appears - a long-haired and fearsome creature, she appears to fly in on the shoulders of one of her apprentices, shrieking in a blood-curdling howl. 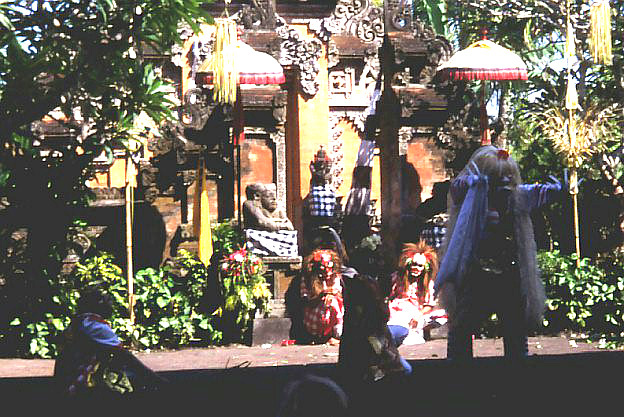 Durga begins her dance of death, preparing to kill Sahadewa. But to her surprise, she is not able to kill Sahadewa. No matter what she tries, she is unable to harm the young man who is protected by Siwa's spell of immortality. This is all part of Siwa's master plan. These kids next to us in the audience were spellbound too. After many unsuccessful attempts to kill Sahadewa, Durga realizes that she is defeated. In a poignant scene she asks for redemption and agrees to be killed to achieve spiritual purification, which is done quite beautifully. But her servant Kalika, angry at Sahadewa for destroying her mentor, also wants to be redeemed. Sahadewa refuses, because this would leave no-one on earth to govern black magic. Enraged, Kalika transforms herself into a wild boar, then a Garuda bird, and finally the powerful witch Rangda, in her attempts to kill Sahadewa. 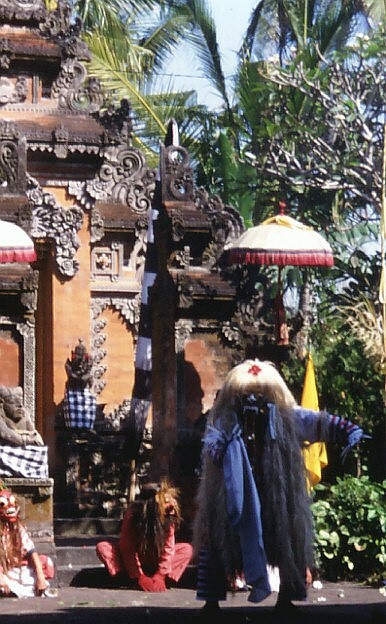 Unable to withstand the onslaught of magical energy from Rangda, Sahadewa summons the Barong. 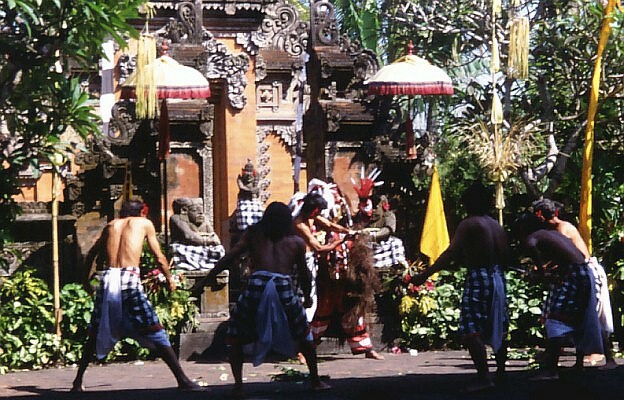 The Barong and Rangda engage in a fierce battle. 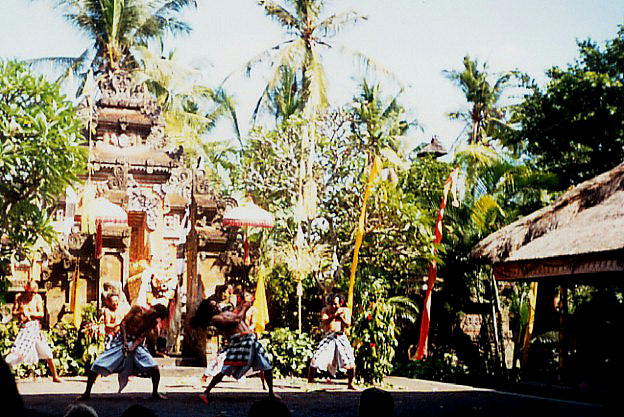 The followers of the Barong appear, and join in the battle, attacking Rangda and stabbing her with their knives. Rangda (and the man playing Rangda, for these knives are very real and very sharp) are protected from harm through the power of trance. Rangda uses her magical powers to cause the men to fall into trance, turning their knives on themselves. But the protective power of the Barong's magic is stronger, and the knives do not pierce the men's skin. The priest arrives and sprinkles the men with holy water, adding to the protection and preventing the men from falling to far into an irreversible trance. 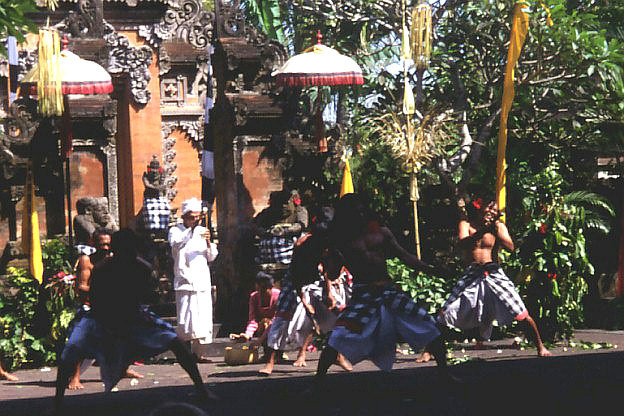 With a few clacks of the Barong's jaws, the men are brought out of their trance. Although Siwa has been joined in heaven by his wife Durga, the inconclusive battle between the forces of darkness and light (Randga and the Barong) signifies the neverending and eternal battle between darkness and light, evil and good. 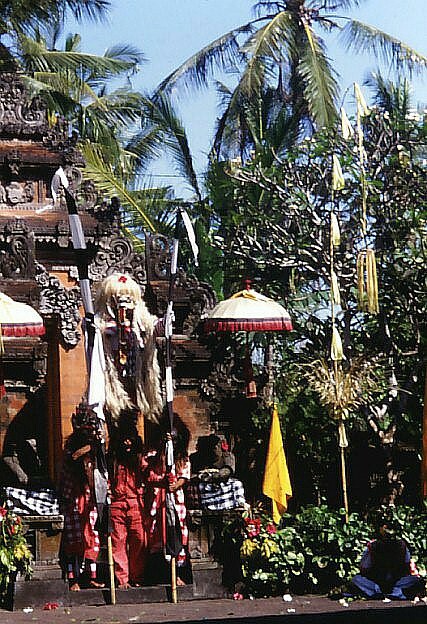 The battle between the forces of darkness and light as depicted in the Barong drama is simply, the Balinese believe, a reflection of the inner battle that goes on within us all. Neither side can ever completely overcome the other - the important thing is to keep the right balance, and recognize negative energy and turn it to good use. It seemed a fitting performance for one of our final days in Bali.